This morning I stopped by a Health Fair that my office coordinated at Juntos Park in Glassell Park. Many neighborhood families turned out to learn more about opportunities to live healthier, safer lives. I want to thank the community organizations and city departments that participated in providing information. Today I joined several bike riders in the kick-off bike ride to celebrate the start of Car-Free Fridays. 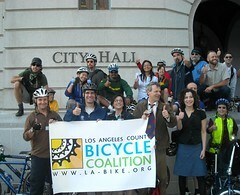 Sponsored by the Los Angeles County Bicycle Coalition, this campaign is encouraging L.A. City residents to leave their cars at home at least one Friday a month. Beginning at 8 a.m. at the Hollywood/Western Metro Red Line Station, we made our way downtown in record time, finishing at L.A. City Hall. 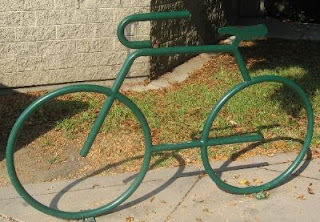 Riding a bike, carpooling with a friend, or taking public transit on Car-Free Fridays is a great way to reduce your carbon footprint and get a work out at the same time. Choosing to leave your car at home even one day a week can be of great benefit for your health, wallet, and the environment. I also announced the launch of NavigateHollywood.com, Hollywood’s first interactive way-finding website. 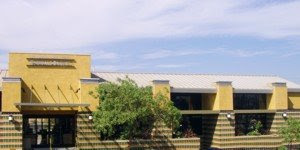 The Hollywood Property Owners Alliance managed the development of the site, which has received financial support from more than a dozen Hollywood businesses. In addition to being a one-stop shop for information about public transit, parking, taxi, and bicycle facilities, the site allows users to sign up to receive messages about street closures or special events via SMS text or e-mail. Check it out now! I wanted to take a moment to salute the men and women of our Fire Department. This afternoon I visited some of the firefighters at Fire Station 50 in Glassell Park. These people are truly dedicated public servants who not only help protect us from fire, but are often the first responders in medical emergencies. We all owe them a debt of gratitude, so be sure to thank them next time you see a bright red fire truck in your neighborhood! I stopped by a meeting of the Greater Echo Park Elysian Neighborhood Council tonight to see what issues the group is working to address right now. This neighborhood council is particularly of interest to me because it's my own! The 2009 Greater Los Angeles Homeless Count, which kicks off tonight, will be the largest homeless count in the nation and will help gather information needed to end homelessness in our communities. Over 3,500 volunteers have already signed up, but it’s not too late to get involved. The Los Angeles Homeless Services Authority still needs volunteers on Wednesday, January 28 in the San Gabriel Valley, East Los Angeles, and the South Bay, and on Thursday, January 29 in South LA. Click here for more information and to sign up to help. The Alliance of Neighborhood Councils met this weekend at Los Angeles City College in my district. Dozens of representative from communities across Los Angeles came together to talk about issues important to our city. 1. Organize for change. Change begins with the strength of your network and the numbers of people that you have regularly involved in initiatives. The Obama campaign showed the ability of community organizing techniques to have a huge impact. Hold house parties, neighborhood coffees with representatives, and do regular door-to-door canvassing. Hold a “Neighborhood Organizing Camp” with stakeholders from the business, residential, faith, and labor communities in your neighborhood. 2. Embrace Web 2.0 and preserve public access to information. Changes to state law have taken away municipal jurisdiction over cable networks, but we have new tools to reach even more Angelenos than ever. Build your own Neighborhood Council YouTube channel, help the city build a new YouTube-like network, and embrace Facebook, Twitter, Flickr and other social networking sites that help bring new people into your neighborhood council network and keep them feeling connected on a daily basis to your work! 3. 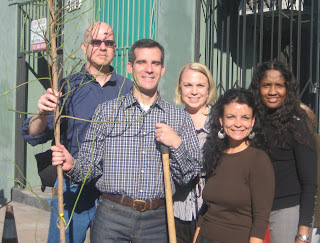 Build a Neighborhood Green Team. The city has programs to green Los Angeles, from free recycling for apartment buildings to free light bulbs from DWP. Recruit and develop a team of youth who can work after school or during the summer for your neighborhood, going door-to-door to help get businesses to go green with the city’s new green business initiative, and let tenants and homeowners know about free trees, recycling, and energy efficiency programs that can help them save money and beautify the neighborhood. 4. Make LA Safer by building a Watch 2.0 newsletter. Watch 2.0 is a powerful tool to help connect neighborhoods to crucial public safety information to avoid and prevent criminal activity in their area. Building a newsletter also helps neighbors get to know one another, building a powerful network to keep crime away. Contact Jeff Berk (jberk@watch2.org) for more information. What an amazing feeling to witness history at the United States Capitol this morning! I will write more later, but for now I'll just say that the feeling of optimism and hope and renewal and patriotism has never been so palpable. 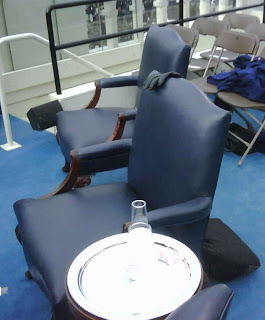 Here's a cool picture I took of the seats where President Obama and Mrs. Obama sat during the inauguration. On Tuesday, I guest-hosted the Politics of Culture on KCRW-FM. I interviewed Left, Right & Center host Matt Miller whose new book The Tyranny of Dead Ideas, is a fascinating discussion of certain assumptions we have come to believe as a culture and how they impact our ability to progress economically and socially. For example, Matt theorizes that the idea your kids will automatically be more successful than you is one that is not true and may actually hinder them. You can listen to the complete interview here. Last night I had the honor of joining my colleague Councilmember Jose Huizar to swear-in the Glassell Park Improvement Association’s new board members. Congratulations to the new leadership. I look forward to continuing to work with GPIA to improve our community! Come celebrate history at L.A’s largest inaugural viewing party! All are welcome to come to L.A. LIVE Tuesday morning for L.A.’s largest inaugural viewing party as President-Elect Barack Obama takes office! L.A. LIVE will be airing live feeds from Washington, D.C., beginning with the Pre-Ceremony Events at 7:00 am, followed by President-Elect Obama’s Oath of Office at 9:00 am, concluding with the 56th Inaugural Parade at 11:30 am. L.A. LIVE is located on Chick Hearn Court, across from the STAPLES Center. If you have questions, please call (213) 473-7009 or (323) 846-2651. The Los Angeles Police Department will celebrate the opening of its 20th police station this weekend when it dedicates the Olympic Station as part of a community ceremony and open house. All are invited to participate in the day's festivities, which will include tours of the new facility, entertainment, food, and a play area for kids. The event is Saturday, January 17, from 9 a.m. to 2 p.m. The Olympic Station is located at 1130 S. Vermont Avenue. This morning, Ricardo Montalban passed away at the age of 88 in his Doheny Estates home. Born in Mexico City, Mr. Montalban found great success in Hollywood as an actor, appearing in more than 80 movies and television shows, perhaps most famously in his roles on Fantasy Island and Star Trek. He is an Emmy Award winner and Screen Actors Guild Lifetime Achievement Award recipient who continued to act well into his 80s. The Ricardo Montalban Theatre in my Council District - where the next generations of performers participate in plays, musicals, and concerts - stands as a fitting tribute to this consummate performer. My thoughts and prayers are with Mr. Montalban's family. He will certainly be missed. This afternoon the City Council's Transportation Committee will meet to discuss ending the city's bicycle licensing program. Although started with the best of intentions, recent reports by the LA Department of Transportation and the Los Angeles Police Commission have concluded that it is outdated and ineffective. The Police Commission recently voted to recommend that we discontinue this program, and I support that recommendation. We should work to make it simpler - not more complicated - for Angelenos to choose alternative modes of transportation such as riding a bike. As the Budget and Finance Committee begins the planning process for Fiscal Year 2009-2010, we invite you to help us better understand your priorities. Come to one of the public meetings listed below to voice your opinion about how the city should allocate our resources. The Los Angeles Public Library has lots of new and exciting electronic resources. Click here to check them out. One of the exciting features is the ability to download podcasts of book readings by leading children's authors. Parents and kids can download these for free to their favorite PDA or PC. Podcasts include biographical information about each author followed by the author's reading from his or her book, inspiring children to check the book out from the library and enjoy reading it at home. Best-selling children's authors currently available on podcast through the library's website include Gretchen Woelfle, Karen Jo Shapiro, and Iza Trapani. Assemblymember Mike Feuer is introducing a statewide moratorium on electronic billboards, and I am fully supporting this effort. Electronic billboards are cluttering our neighborhoods and we need to stop them before they take over our communities. If passed and signed into law, the moratorium would be in place through 2011 to give the city and state the opportunity to strengthen our laws and give local communities more control over where electronic billboards are located. If you want to express your support for Assemblymember Feuer's proposal, you can send him an email by clicking here. This morning I participated in a tree planting ceremony in Historic Filipinotown for the Growing Livable Neighborhoods project, which will bring 1,000 trees to areas throughout the city. The purpose of the project is to encourage more local residents to walk and use public transportation by creating pleasant, shady streets. There are also many environmental benefits associated with tree planting, including reduced energy costs, urban heat island effects, and stormwater runoff. New tourism campaign? That's so LA! Today I joined Mayor Antonio Villaraigosa, Councilmembers Tom LaBonge and Janice Hahn, Universal Studios President Larry Kurzweil, LA INC. CEO Mark Liberman, and many others to roll out a new marketing campaign designed to attract visitors to our city. The new slogan is "That's so LA" and Angelenos can submit their own LA moments here. One in ten homes across the country is in some state of foreclosure. If you are in one of them or think you might be, the Los Angeles Foreclosure Response Network has resources available to help you prevent foreclosure or possibly work your way out of default. There are foreclosure resources available on an on-going basis in Northeast LA at the Metro North WorkSource Center, located at 342 San Fernando Rd. For more information, call (323) 539-2000 or visit www.goodwillsocal.org. Last night I stopped by the Silver Lake Neighborhood Council's monthly meeting as they kicked off the new year. Silver Lake has long been one of Los Angeles's most passionate communities and I encourage local residents who are interested in learning more about what is happening to get involved in the neighborhood council. The Silver Lake Neighborhood Council meets every first Wednesday of the month at Micheltorena Street Elementary School. You can get more information by clicking here. Los Angeles's crime rate dropped again last year and LAPD Chief Bratton has committed to aggressively working to reduce it even further in 2009. I'll be working to support the LAPD by ensuring we provide the department with the resource it needs to protect and serve our neighborhoods. This morning, I attended the formal inspection at the brand new Olympic Station. I'm excited that this facility will help our department better serve neighborhoods in the Central part of our city, including East Hollywood in my Council District. And as wonderful as the new building is, I'm even more grateful to the men and women of the LAPD -- both those who wear the badge and those who do not -- who are working there, helping to make our neighborhoods safer.